New Jersey, California, Texas, Illinois and New York top investment destinations. 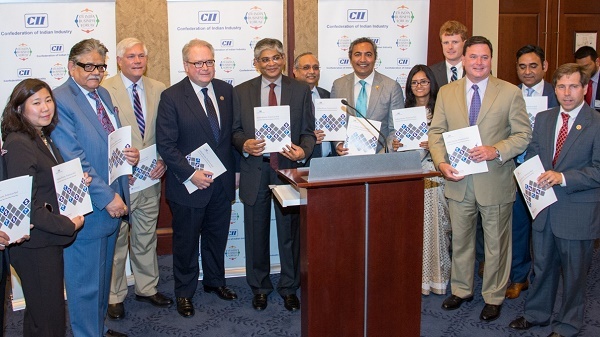 WASHINGTON, DC: India-based companies are responsible for creating 91,000 jobs and $15 billion in investments across the United States, according to a new report released by the Confederation of Indian Industry (CII) and Grant Thornton (GT), on Capitol Hill, on Tuesday. For the first time, the report, “Indian Roots, American Soil,” also captured a state-by-state breakdown of tangible investments made and jobs created by 100 Indian companies doing business in the United States. New Jersey, California, Texas, Illinois and New York are home to the most Americans directly employed by Indian companies. Texas, Pennsylvania, Minnesota, New York, and New Jersey have the highest foreign direct investment (FDI) from Indian companies, says the new report. Indian Ambassador to the United States Arun Kumar Singh and a number of influential members of Congress, including Indian American Ami Bera, D-CA, attended the event. “Today Indian companies are not just investing and creating jobs, they have also become significant stakeholders in the growth and prosperity of their local communities. Their linkages run deep through the support extended by them to education programs and capacity building. The CII study draws attention to the growing contribution and influence of the Indian industry, which forms an important component of our growing and vibrant relationship with the United States,” the ambassador added. Together, 100 Indian companies employ more than 91,000 people across 35 states and the District of Columbia. The total value of tangible investments made by these 100 companies exceeds $15.3 billion. The top five states in which Indian companies have generated maximum employment are: New Jersey (9.278 jobs), California (8.937 jobs), Texas (6,230 jobs), Illinois (4,779 jobs) and New York (4,134 jobs). The top five states in which Indian companies have contributed the highest foreign direct investment are: Texas ($3.84 billion), Pennsylvania ($3.56 billion), Minnesota ($1.8 billion), New York ($1.01 billion) and New Jersey ($1 billion). The average amount of investment received from Indian companies per state is $443 million. 84.5% of the companies plan to make more investments in the United States. Participating companies in the Capitol Hill event included Bank of Baroda, Birlasoft, Cyient, Dr Reddy’s Laboratories, EsselPropack, Exim Bank, ICICI Bank, Infosys, ITC Infotech, Larsen &Tourbo, Mahindra USA, Mindteck, NIIT, Piramal Healthcare, State Bank of India, Sun Pharma, Taj Hotels and Resorts, TATA Communications, TATA Group, TATA Consultancy Services, Torrent Pharma, Wipro and Wockhardt. James Shapiro, Resident Director – North America, Tata Sons Limited, said in a statement: “We are proud to be part of the Indian FDI story and are thrilled to be represented at today’s CII event on Capitol Hill. The Tata Group has had operations and investments in the US market for many decades. Today we have 12 companies with an operating presence in the market, in very diverse industries including, software and IT services, hotels, automobiles, telecom, chemicals and engineering. Commitment to our core stakeholders – customers, employees and the local communities we operate in — is at the core of the Tata philosophy and the way we conduct business in the United States. The CII-GT survey respondents represent diverse sectors including pharmaceuticals, telecommunications, financial services, health care, materials and manufacturing, media and entertainment, tourism and hospitality, engineering and construction, automotive, food and agriculture, energy, and information technology. Hi this is srinivas, I am currently looking out for a job in usa. At present I working with one of the leaing bank as a corporate sales manager. Hello. I am currently looking out for a job in The United States of America. At present I am working with one of the Leading real estate company as a Customer Relations – Manager. My self Vasudeva Murthy Gunduboina came on Green Card to USA on 06 Jan 14. I have 20 years experience in operations in Indian Navy and presently I am working as a Sales Manager for a Granite company on East Coast. I am a Job Seekar, can you suggest me the right job for me in USA. Hi boss me from india now desided to work in USA i hv completed Bsc now I m doing medical course but I hv money prblm so i hv leave our study . So I humbly request to u if any types of job for me then plz suggest me .so for that I will always be obligated to u for this . Ur obidently worker :-Manoj kumar sharma. Note :-i can do any work but hv more knowledge in medicine department. iam sadiq ali.from india.i want one job.please contact my mail.sadiqek243@gmail.com.